Exchange to Lotus Notes migration software to export Exchange mailbox to Lotus Notes email client. The utility can convert corrupted EDB files to NSF file format in Lotus Notes 9.0, 8.5, 8.0, 7.0, 6.5 and 6.0 versions. And the tool can operate on all Windows OS versions like Windows 10, 8.1, 8, 7, Vista, XP, etc. The Exchange to Lotus Notes migration Tool helps to migrate EDB to NSF file format in Lotus Notes. The tool require installation any of the Lotus Notes versions like Lotus Notes 9.0, 8.5, 8.0, 7.0, 6.5 and 6.0 in the user system. The tool allows the migration of Exchange EDB files into Lotus Notes NSF file. This tool transfers the entire database such as emails, task, contacts, calendars, notes, journals, etc. 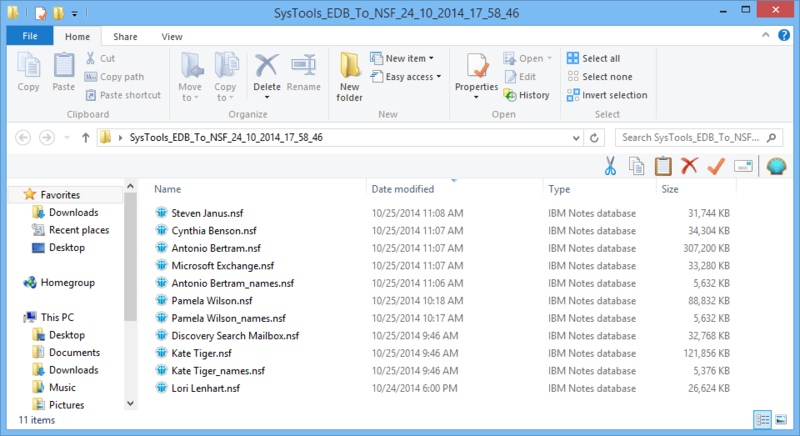 A single NSF file is created for each EDB mailboxes by this software. When the users exports items from EDB data files into NSF format, the software stores the data individually. For each mailbox, a file will be created as names.nsf and all the contacts will get stored into it. Therefore, it is easy for the users to access the contacts after the conversion is done. 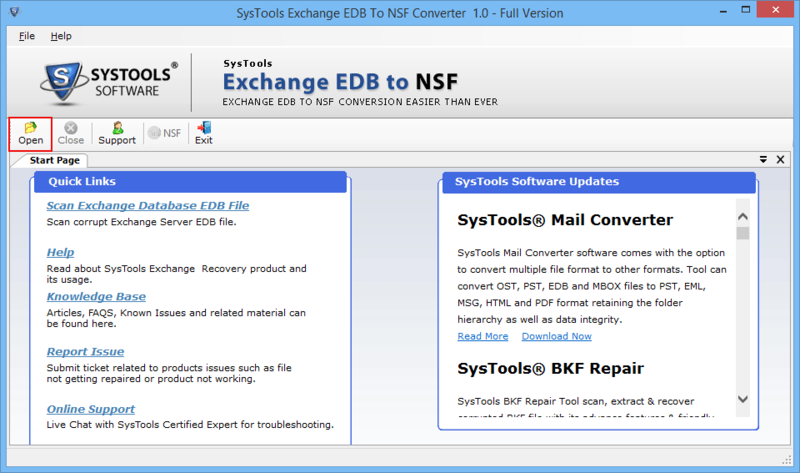 EDB to NSF Migration tool has the potential to recover those Microsoft Exchange files, which are corrupted. The tool performs the in-depth scanning of the damaged database and loads the entire mailbox. Once it is done, users can start the process and export the items from Exchange EDB to NSF in Lotus Notes. To Migrate Exchange to NSF format Lotus Notes, the tool provides the choice to choose desirable things to be converted. Users can migrate selective mailboxes or items. For this, users have to mark or unmark the things they want to migrate or shift. This feature helps users to do the conversion task easily. Exchange to Lotus Notes Migration tool, transfer all the EDB files to NSF in a way that the data remains intact. During the process, the application provides the detail of the process. This includes the number of the items or folders that are converted along with the contacts, tasks, journals, calendars, etc. How to convert Exchange EDB File to Lotus Notes NSF File? Step 2 : Now, click on Open option and open the preferred EDB file. Step 3 : In the pop-up screen, click on “Browse” to locate EDB files from system. Q. Does this software convert EDB to NSF files of any size? "I have some EDB files that are very huge in size. 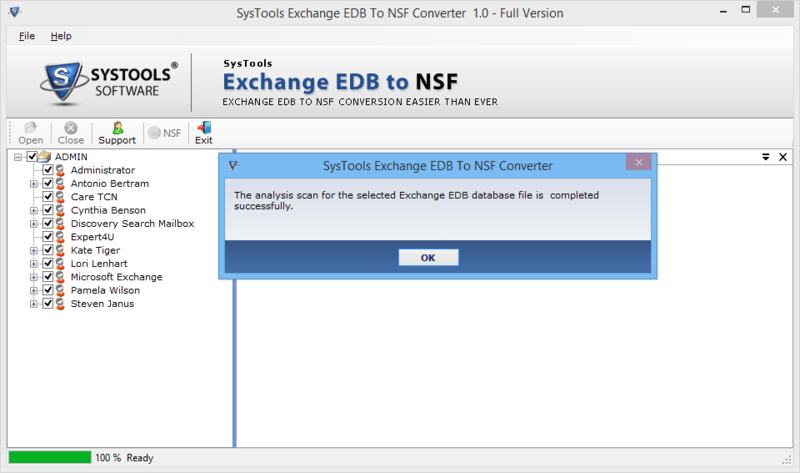 I want to convert those Exchange EDB files to Lotus Notes NSF format. 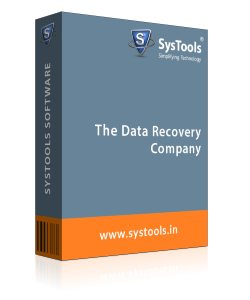 Does this software convert all EDB files, no matter what the size of the file is?" Ans: Yes, Exchange to Lotus Notes Migration Tool can convert all the EDB files to NSF format despite of its size. Q. Can I transfer corrupt Exchange EDB files into NSF format? Ans: Yes, this software first deeply scans the selected MS Exchange database files and then, converts EDB files into NSF file format Lotus Notes 9.0 all other below editions. Q. Does the software move multiple EDB file at once in bulk? Ans: Yes, MS Exchange EDB to Lotus Notes Migration Software can export all the Exchange database files into NSF format in bulk without any data loss. The tool can also convert corrupted EDB files to NSF format effectively. 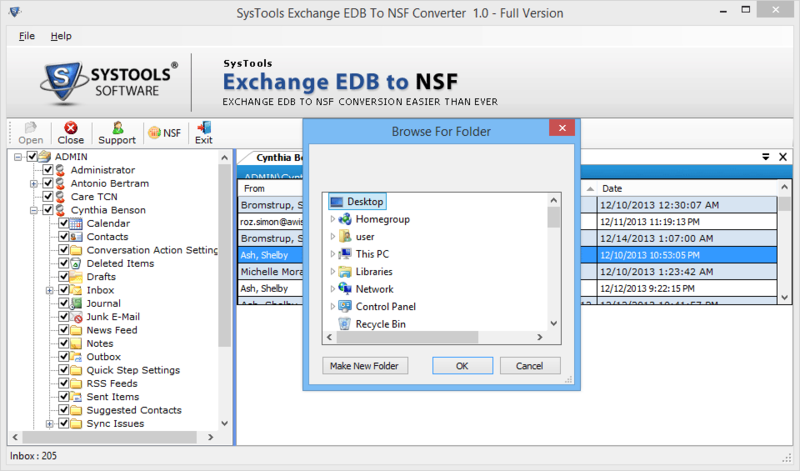 Lotus Notes to Exchange Converter tool is an efficient and effective solution to export NSF files to EDB file format. This product provides an easy and user-friendly interface and takes very less time for converting NSF files to EDB format. The Lotus Notes to Exchange Migration software supports Microsoft Exchange 2016, 2013, 2010, 2007, 2003, 2000 versions with 32 and 64 bits. The Mail Migration tool can easily transfer Lotus Notes NSF files to live Exchange Server. With the help of this option, you can map Lotus Notes files to Exchange server mailboxes. For this, it is required to install the IBM Lotus Notes application, because Live Exchange Server environment is necessary for the migration. You can convert any type of encrypted NSF files to Exchange Server. For doing this, the software gives permission to remove encryption of any message in Lotus Notes NSF file and convert NSF data to EDB format in MS Exchange Server. This is an optional feature of this utility, so one can check or uncheck the feature according to their requirement. The Lotus Notes to Exchange Migration software provides a feature to migrate multiple NSF mailboxes to MS Exchange at once. However, it allows you to perform step by step operation to export Lotus Domino Server mailboxes to Exchange EDB in batch. With the help of Mail Migration wizard, you can perform batch migration as well as selective migration. For this purpose, there are many filtering options provided by this NSF to EDB Migration application. you can apply various filters like Email filter, Calendar filter, To do filter to export limited amount of data & it also save unnecessary time consumption. The software has an option to maintain the file Internet Header. The Internet Header means that if any single file or message contains certain properties or associated details that will help to detect its origination, then this property is called Message Internet header. The Lotus Notes to Exchange Migration ensures to keep this Internet header same as the original. The NSF Files to EDB Converter software allows the recurrence for Calendars while moving NSF data items from Lotus Notes NSF to Exchange EDB format or any other respective format. It also offers the different types of Calendar recurrences such as Yearly, Monthly by Date, Monthly by Day, Weekly, Daily, etc. How to Convert NSF Files to EDB Format? Step 1 : First of all, download and run the SysTools Lotus Notes to Exchange Converter. Step 2 : Then, click on the Add Folder to add multiple NSF files to the system & click on the Next button. 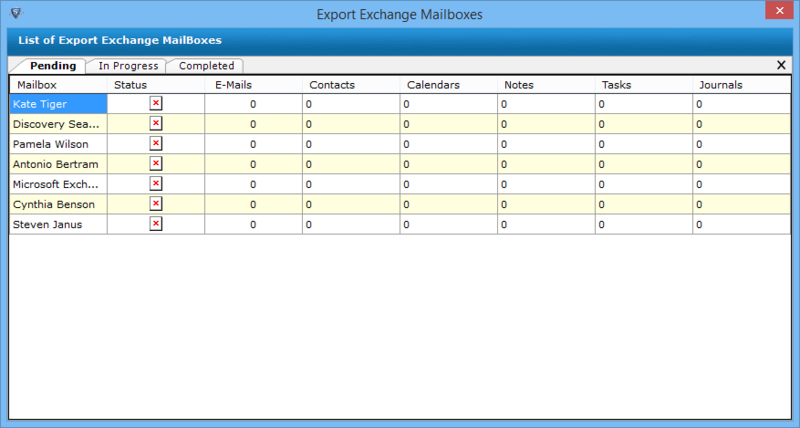 Step 3 : After that, click on the radio button next to the Exchange and select the chechbox Maintain folder hierarchy. Then, select the versions of Exchange and click on OK button. Step 4 : In next step, provide the admin credentials and IP Address and click on the Submit button. Step 5 : Now, you will see the list of addresses of data which is to be migrated. Step 6 : Next, click on the Mails radio button >> Apply filter then Click on Set button. Step 7 : Further, click on the Contact button >> Exclude Duplicate Contact >> Set button. Step 8 : Next, click on the Calendar button >> Apply filter >> Set button. Step 9 : After that, click on the Tasks button >> Apply filter >> Set button. Step 10 : Now, click on the Journal button >> Apply filter >> Set button. Step 11 : In this step, go to the Apply Advance Settings. Then click on the Settings button and set the options, Email address, Custom folders, Include folder according to your need. Step 12 : Finally, Click on the Export button to start the Lotus Notes to Exchange EDB migration process. Step 13 : Now, click on the Save Report button to save all details in .csv format. Step 14 : At last, you can view the export report at the desired location. Watch!! 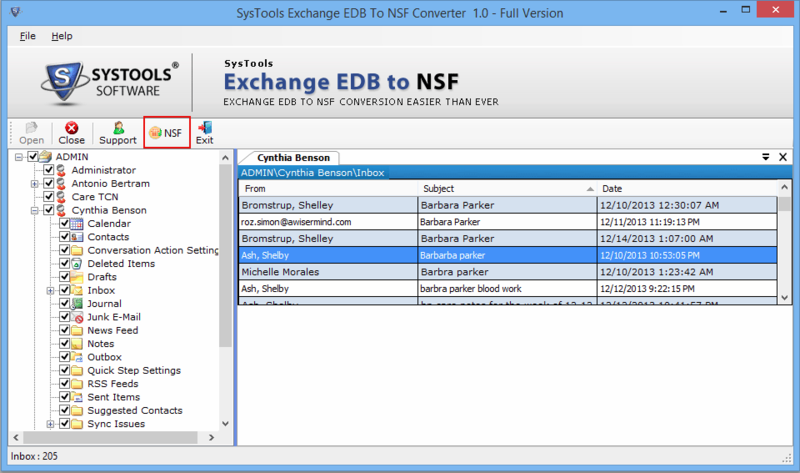 How to Export NSF Emails to EDB? Q. Does the tool migrate Calendars from Lotus Notes to Exchange format? 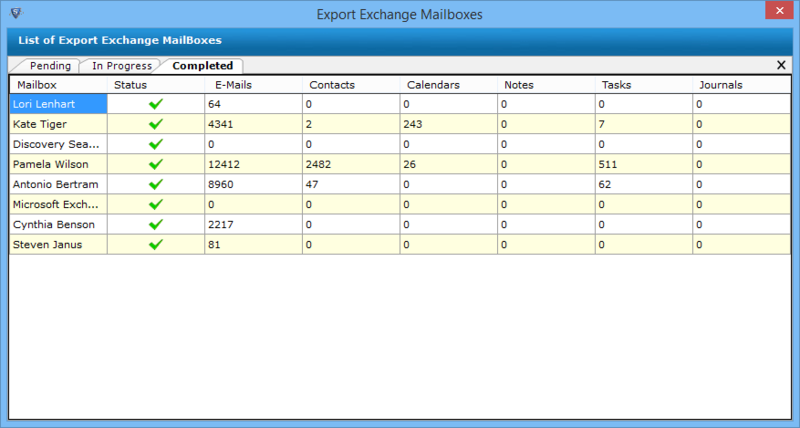 Ans: Yes, the tool is able to migrate emails, calendars, contacts, tasks and journals from NSF file to Exchange Server. Q. What are the credentials required for conversion of NSF to Exchange? Ans: For conversion, it is required to have Domino server name and its password & Admin id and password of Exchange server. Q. Which versions of Lotus Notes is supported for the NSF to EDB migration? Ans: Lotus Notes to Exchange Converter supports all versions of IBM Lotus Notes like 9, 8.5, 8.0 etc. Q. Can I migrate Lotus Notes to PST in bulk? Ans: Yes, you can perform NSF to PST file conversion in bulk by using this application. Q. Does this software work with Windows 10? 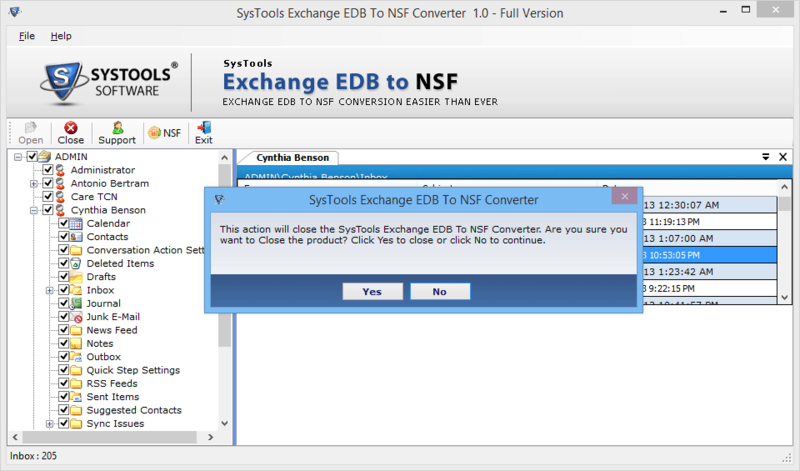 Ans: Yes, the NSF to EDB software works on Windows 10 and all below versions. 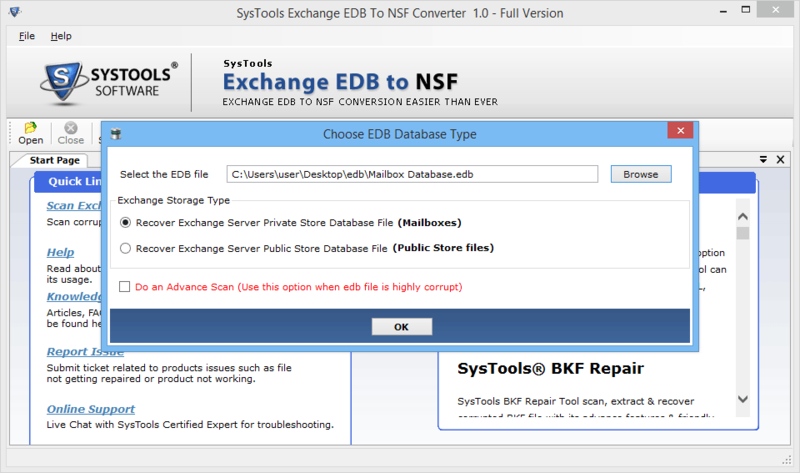 It was really tough to repair and convert highly corrupted EDB files to NSF format before I came across this EDB to NSF converter. This software is unique in its features and designing; and it converts all Exchange EDB files of any size into NSF in a very quick way. I would like to recommend this application to every user. Exchange to Lotus Notes Migration Tool is one of the major factors to maintain the continuity of our business. It is a laudable utility and has a very simple interface. It offers bulk conversion, retains the integrity of the data and what not. I would like to pay my regards to the whole team for such a tool. “I was looking for an automatic solution to convert data from Lotus Notes to Exchange Server. From further research, I got SysTools NSF to EDB converter tool, which directly migrates the Lotus Notes database to MS Exchange mailbox completely without harming my data and interrupting its folder structure. Thanks a lot for developing such a superb tool!! It was always a difficult task for me to working with a software but recently, I came to know about this Lotus Notes to Exchange Converter tool. I am highly impressed with the features and working of this software. I must say this product has resolved my biggest query that how to export migrate multiple NSF files to the desired Exchange mailboxes in a secured manner. I would suggest this tool to all the users.